Another post from Ogre Jenni—hope you kids don't mind. I work at George's cinema in Santa Fe—what a lucky ogre I am! Beginning this Friday, Jean Cocteau Cinema will proudly screen The Mermaid (Mei Ren Yu), the latest film by Stephen Chow. Chow is the Chinese filmmaker (and talented martial artist) responsible for Shaolin Soccer (2001) and Kung Fu Hustle (2004). Chow brilliantly parodies absurd action and kung fu movie tropes, and he is well known for his over-the-top martial arts sequences, bizarre circumstantial comedy, and quirky characters. 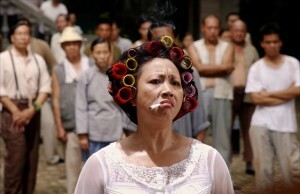 Who doesn’t love the surly chain-smoking landlady from Kung Fu Hustle? 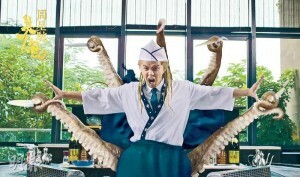 And who won't love the half-octopus mer-uncle sushi chef in The Mermaid? David Ehrlich from Slate says of Chow's latest film, “...it's demented. Great. And a hit." He also adds that, "…Chow, without overlooking his hometown crowd, directs with a primal wit that appeals to all audiences with the immediacy of silent cinema.” Read his full review here! Xuan's estate project involving reclamation of the sea threatens the livelihood of the mermaids who rely on the sea to survive. A mermaid named Shan is dispatched to assassinate Xuan, but this inevitably leads to a complicated, interspecies, office romance. Out of his love for Shan, Xuan plans to stop the reclamation. Unfortunately, Shan and the other mermaids are hunted by a hidden organisatio, and Xuan has to save Shan before it's too late. See you at the Cocteau! You go to Westeros, Tower of the Hand, Winter Is Coming, Watchers on the Wall, or one of the many other fine fan sites where GOT is being discussed. Not here, please. Thank you.